Since you were born, your sister has been by your side through thick and thin. School, jobs, weddings, and now children have changed your lives, but never changed your relationship. This year, use this Mother's Day for Sister card to celebrate your sister and everything you love about her! On this special day, she'll love hearing about the way she inspires you every day! The bond between sisters is unique, beautiful, and strong. Your sister will always be the world's best person and now that she has children, she's the greatest mother, too! This Mother's Day card is filled with light and love, just like the joy that your sister brings to your life. 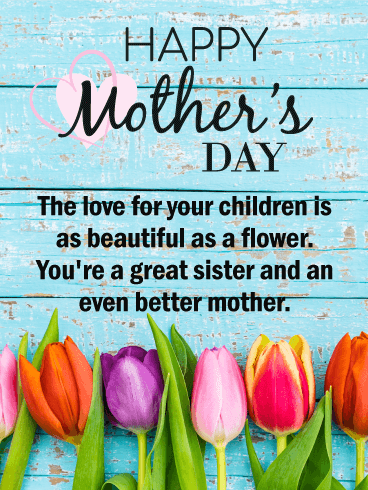 Show your sister just how much you love her by sending this Mother's Day card today! Anyone who thinks that Mother's Day is a relaxing holiday for moms never had any kids. 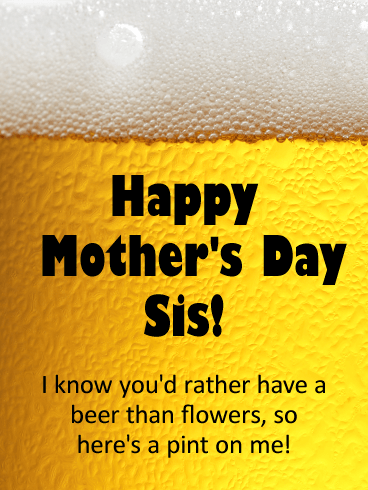 Your sister is one of the best moms you know, so send her this funny Mother's Day card to add some humor to her day. You both love your nieces and nephews, but Mother's Day can be a bit chaotic. 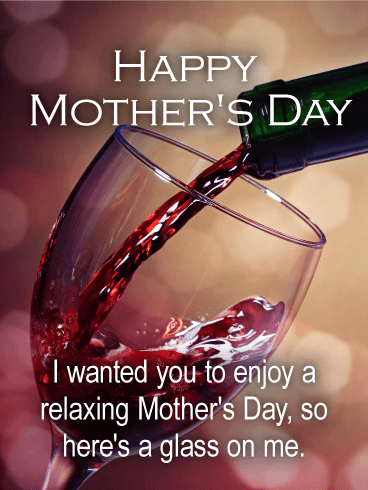 With this Mother's Day card, you can make your sister laugh and remind her that nothing is more relaxing than a glass of her favorite wine. Your sister is your best friend and there is no one who is a better mother. As Mother's Day approaches, show your sister how much you care about her by sending this sweet Mother's Day card! The sweet gesture and beautiful bouquet of flowers will brighten her day and bring a smile to her face. 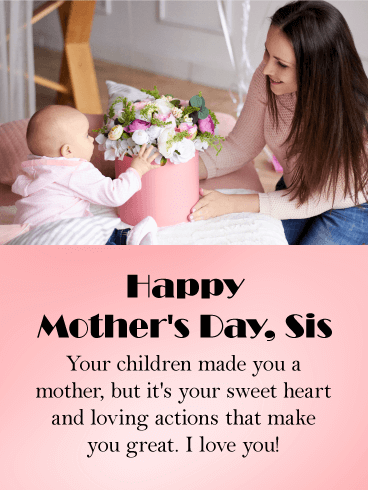 Let your sister know just how terrific she is by sending this Mother's Day card to celebrate the holiday! Motherhood blooms and unfolds like a rose in a garden. The paths toward our unfolding are different but the beauty of love is the same. Honor your daughter with this gorgeous mother's day card. Being a woman and mother is a journey that takes courage and love. Let your daughter know she never ceases to amaze you with this sweet and thoughtful mother's day card. One of the only bonds stronger than the bond between sisters is the connection between mothers and children. 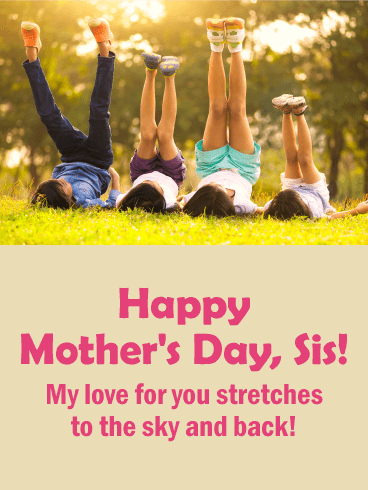 Your sister is your best friend, so celebrate her with this beautiful Mother's Day card! Motherhood is hard, but your sister is the most loving and amazing mother you have ever known. 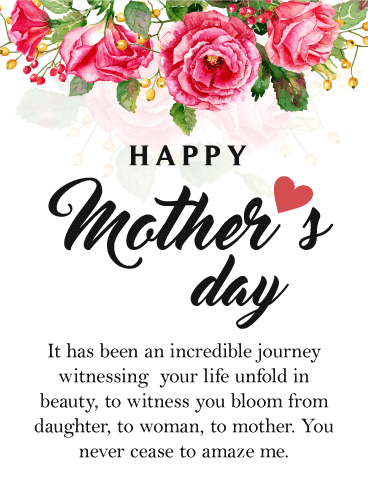 Let her know how much you admire her by sending this Mother's Day card to her today! Your childhood was filled with laughter and love shared with your sister. Now that you're both grown, this joy is shared with your children, too! To remind your sister of these sweet memories and celebrate her motherhood, send this Mother's Day card! 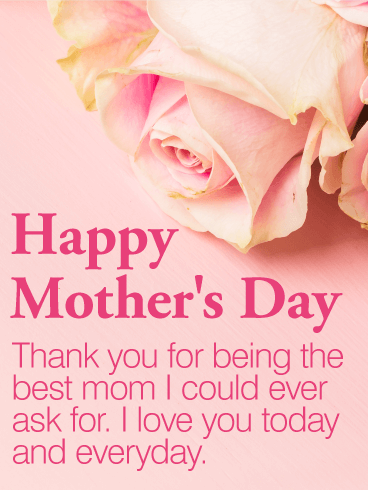 The warm picture will remind her of just how much she is loved, so use this Mother's Day card today! Your sister is one of the most amazing people you know, so it's no surprise that she’s also the best mother. 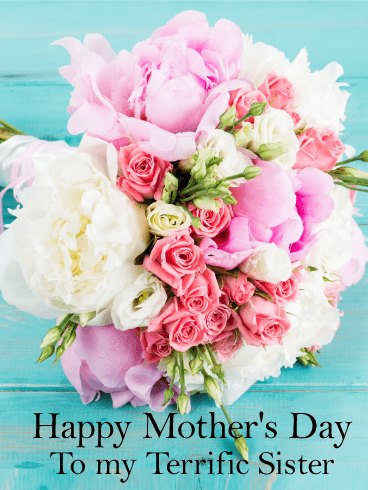 Celebrate the hard work and sacrifices she makes by sending her a Mother's Day card! This bright and colorful card will show her how much you admire and love her. 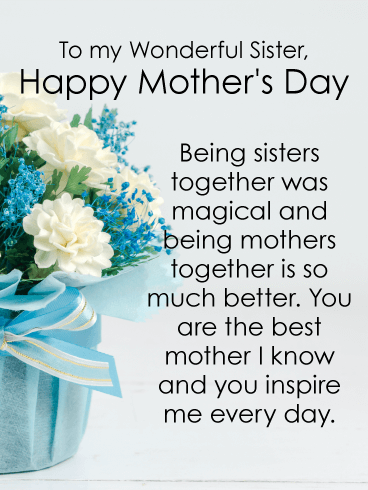 There's no one better or more deserving than your sister, so brighten her day by sending this Mother's Day card today! Any woman can be a mother, but only your sister can be the best mother! Rain or shine, your sister always loves and cares for her children like no other. 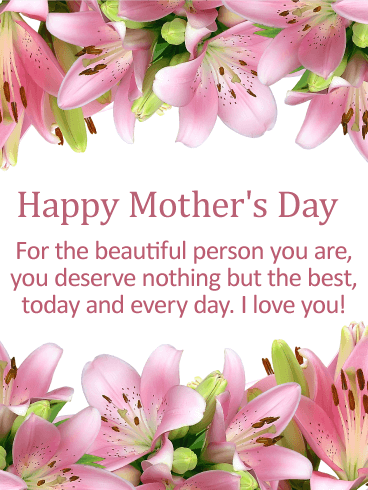 This year, use this Mother's Day card to tell her how amazing she is! The sweet picture will remind her of the best parts of motherhood and the kind message will show her just how much you care. You and your sister have always been close. Now that you are both grown with children, celebrate by sending your sister this funny Mother's Day card! Raising a family is hard and nothing helps more than a tall glass of cold beer! After all, flowers die, but tipsy memories last forever! 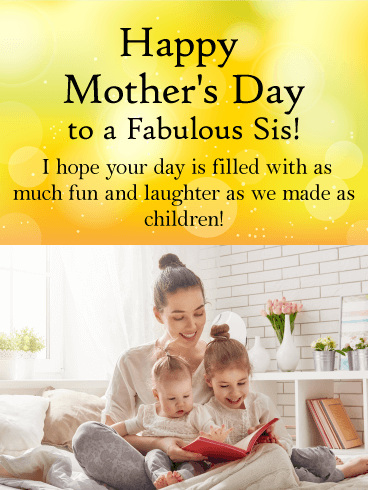 Add some fun and laughter to this special holiday by sending this Mother's Day card to your sister today! You have shared your sister's excitement since the day she found out she was going to be a mother. From that moment on, you have watched her grow into the incredible woman and mother she is today. 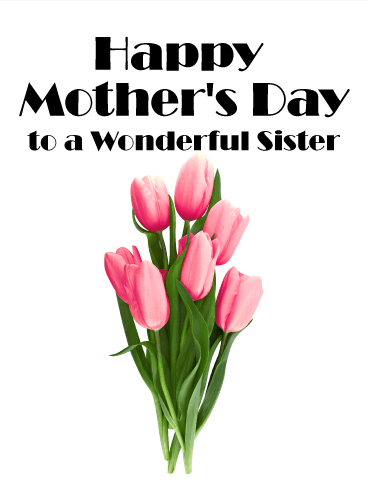 On Mother's Day, celebrate her by sending this Mother's Day for Sister card! The beautiful design and sweet message will show just how much you love her. 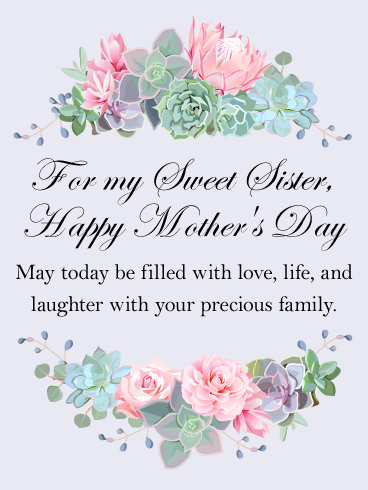 Use this Mother's Day for Sister card to make this day even more special.